The Uchu Sentai Kyuranger finale has come and gone. Was the series popular and successful? It’s probably too early to tell but we tuned in every weekend to watch the show. Our finances also took a hit over the year purchasing all the mecha and various kyutama that released. In celebration of the finale and in its potential to be the next season of Power Rangers, we’ve hand-picked over 500 screen captures of the last episode! So consider yourself lucky – haha! – and take a gander! Enjoy all 500 screen captures of the Kyuranger finale by clicking the title of the story! AND – just for fun – check out this little “what if” video we made below! Fans of Kamen Rider are all too familiar with the Detail of Heroes photograph book series which features high quality, up close and personal details of their favorite Kamen Rider characters. For the first time ever, a Super Sentai series will grace the pages of the Detail of Heroes series. In Japan, it is customary for families to have a piece of cake during the Christmas season and it’s nearly that time of year again. 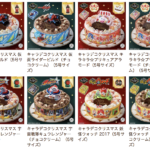 P-Bandai just started their ordering service for Kamen Rider Build and Uchuu Sentai Kyuranger themed Holliday cakes. While most of us overseas won’t be able to enjoy the cake itself, it is noteworthy to mention that this is the only way you’ll be able to get this year’s Christmas themed roleplay items: with a Christmas Kyutama and Christmas Full Bottle being included along with their respective cakes. Each cake will also include an appropriately themed topper with featuring super deformed versions of Kamen Rider Build Tank Rabbit Form and ShishiRed Orion. Both cakes will set you back 4,104 yen each and will be released December 2017 in time for the Holidays. Thanks to Bandai Japan we now have official images of the upcoming Orion Battler and Orion Voyager toys. 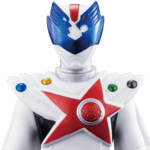 This may be the final mecha of the popular Uchu Sentai Kyuranger series and the Orion Battler allows for a number of your voyagers to connect to form various exciting modes. 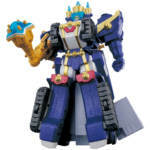 The Orion Battler has a total of 4 different modes as well as lights and sounds from the Kyurangers. The release date is October 7th and will retail at the suggested price of 12,000 yen. Click the title of the story to check out all of the pictures. 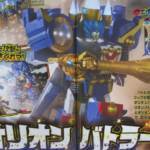 Uchu Sentai KyuRanger October Magazine Scans Online- Introducing The Orion Battler! The latest round of magazine scans for Uchu Sentai KyuRanger has been posted online! *The main attraction this month is the ORION BATTLER! With his new power-up form, Lucky obtains access to 2 new Mecha- the Orion Voyager and the Battle Orion Ship. These two combine to form Orion Battler, the strongest Mecha yet revealed! *By working in unison with KyuRenOh, RyuTeiOh and Gigant HoOh the Battle Orion Ship takes on a new configuration known as Orion Bazooka that can destroy any Jark Matter warrior it targets. *The new powers of Shishi Red Orion will quickly overwhelm the Vice Shoguns but Don Armage’s mysterious powers make sure their battles will continue. *Last but certainly not least, Oushi Black will take center stage in the coming episodes to explore the connection between Champ’s creator and Jark Matter. Along the way, the KyuRangers will encounter a mysterious new entity known only as Cow-Type Military Weapon Number Zero– a prototype version of Champ built for evil purposes! Definitely some exciting adventures ahead for the 41st Super Sentai Series! Stay tuned to TokuNation as we keep you up to date on all KyuRanger news! Remember those awesome Kyuranger figures Bandai’s been teasing us with all month? Our friends over at HLJ and AmiAmi just put them up for pre order. With that, we now have a release date and pricing. This new line will be dubbed Kyuranger Yuudou, the first wave of these figures will come out December 2017 and will cost 4,104 yen for a full case and each case will contain 10 figures per box. 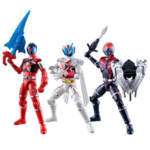 The first assortment will consist of the previously revealed Shishi Red, Shishi Red Orion, and Houou Soldier. 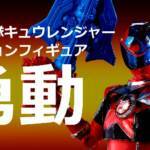 Get ready Uchu Sentai Kyuranger fans – yet another power up is coming for your favorite lucky Shishi Red Kyuranger! Thanks to Bandai Japan, we have official images of both the DX Saiko Kyutama as well as the form it unlocks for Shishi Red – the Shishi Red Orion form! By rotating the ring of the DX Saiko Kyutama, Shishi Red can transform in to Shishi Red Orion, a slick looking power up form. Check out the official images of the DX Saiko Kyutama, as well as the upcoming Shishi Red Orion vinyl figure, by clicking the title of the story! First Look At Articulated Kyuranger Candy Toy Figures! In case you missed it, Bandai announced that a line of Sodo-styled figures for Uchuu Sentai Kyuranger is coming down the pipeline. Bandai’s official Candy Toy blog been updated with our first look at this exciting new line of articulated toys. Three figures have since been revealed; the previously announced Shishi Red now in color along with Shishi Red Orion and Houhou Soldier. Unfortunately, no release info’s been given for these figures as they still appear to be in development. We’ll bring you more info as it becomes available, in the mean time make sure join our discussion thread after the jump!